The 2017/2018 season wasn’t easy for Lille. They finished 17th in Ligue 1, only five points above the relegation zone. They lost 20 games and only won 10 in a total of 38. The team urgently needed to change and set a successful project for the following year. This season is being thunderous for Lille. They are currently second in the league, with seven more points than third place Lyon. They are the second-best defense of the league with only 24 goals suffered (behind the 16 suffered by PSG) and are the third best attack with 45 goals scored (behind the 86 of the PSG and the 50 of Lyon). One of the main responsible for the brilliant season of Lille is Nicolas Pépé. The 23-year-old Ivory Coast native, plays as right winger and arrived at the french club last year from Angers, in exchange for 10 million euros. In 39 games scored 14 goals and assisted five, positive numbers for a debut season. But it’s this season that he’s stooding out, game after game. At this moment, Pépé has 18 goals and 11 assists, and is the second top scorer in Ligue 1 with 17 goals. Pépé is a left-footed that plays as right winger and likes to cut inside in order to benefit his preferred foot. He’s very fast, has great dribble, has good vision and ease to find teammates. 18 goals and 11 assists are impressive numbers, but let’s analyze the statistics in a more detailed way. The winger seeks to penetrate the opposing defense and appear in finishing zones. Through this he shoots on average 3.3 times per game, a statistic that originates the high number of goals scored this season. He’s very good in dribbling and seeks it throughout the game. Dribbles on average 2.5 times per game, trying the 1v1 or cutting inside. Consequently of this way of playing are the fouls suffered: 2.9 per game. Pépé has good vision, proof of this are the 11 assists this season. He passes on average 31.4 times per game, and 1.8 of them are key-passes. In addition to this, he has 77% of pass accuracy. Some less positive statistics are the 2.9 times that he loses the ball per game, which is the result of his playing style. The 0.3 crosses per game is a very strange statistic for a winger, but his way of playing is not necessarily based on crossings. Pépé is a pacey winger, especially for someone with 183 cm. He has a lot of technique and has a fantastic dribble. It is very easy for him to dribble in short spaces, due his technique, he can solve quickly and with quality in a short space. He seeks several times to dribble the opponent, since he’s very strong in 1v1. He also works well on the line, looking to leave free space in the center of the pitch. The usual movement by Pépé it’s a reminder of Robben: often he cuts inside for the left foot and from there he seeks to enter in finishing zones or shoot outside the box. The winger is not always in the same space in the field. Several times he comes down on the side to get the ball and start an attack. He also usually moves to the center of the pitch, almos like a number 10, and then, or unbalances the defense with his speed, or initiates a dangerous attack in the offensive midfield of the opponent. Pépé sometimes is too selfish on the ball and does not pass it in the correct time. This is also one of the reasons why he loses the ball 2.9 times per game. The cutting inside is a good movement, he manages to fairly unbalance the opposing defense and appear in excellent positions. Allows the full back to get up on the pitch, through balls to the strikers and allows the midfielder to offer passing lines. But this constant movement becomes predictable for the opponent. This is not a defect, but to mix even more the movements is something that Pépé should do. He can seek to move more between the last line of the opponent’s defensive midfield and the defensive line, taking advantage of all his speed and unbalance ability. With his passing ability and ease in assisting, Pépé can look for the space between the full back and the center back in order to enter more quickly in the box. He can take advantage of his acceleration to search for rupture movements and appear more in the lateral side of the box to, for example, make a key pass or a cross. Without the ball would also be interesting to keep the cutting inside movement, but closer to the defensive line, in order to receive the ball in finishing zones. 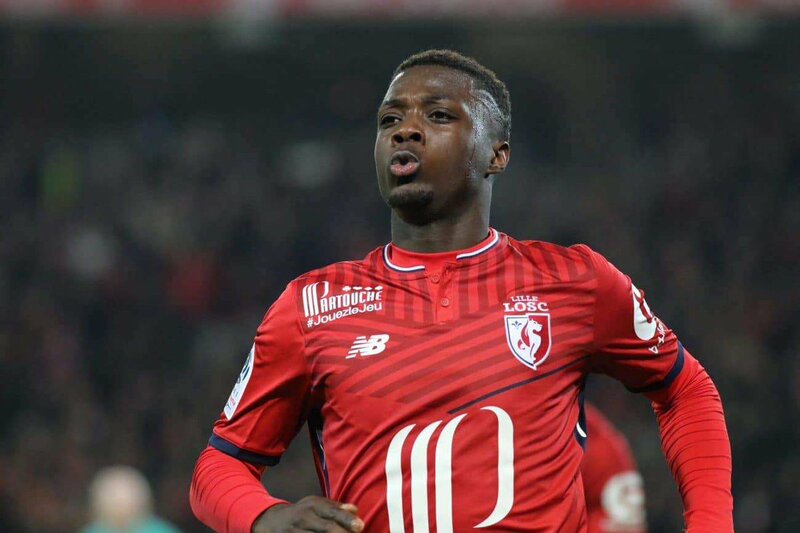 Pépé is a player with a huge margin of progression, and it will be very difficult for Lille to keep him if he continues to play at this level. On the right team, with a manager who helps him improve his game in order to develop as a player, he has everything to become a world-class winger.